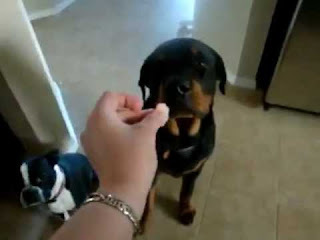 Amazing video that shows a Rottweiler who refuses to eat shrimp. It is unbelievable how these dogs express their feelings, the Rottweiler at first wants to try the shrimp but then refuses it and while the owner wanted him to try he kept telling her no. This dog seems to be really smart because it is reported that dogs may be allergic to shrimp, a lot of dogs don't like it. Interesting, every one of my dogs loves shrimp and the rotties seem to love it more than the other breeds. This dog may be one of the rare ones with allergies to shellfish. My vet told me shrimp are very good for the dogs because they provide a natural source of glucosamine that helps with joint health which is extremely important to large breeds like my rotties. I also regularly feed my rotties and pits crab leg shells and leftovers. They love them and have very clean teeth afterwards.